The Rainbow Six Pro League is the stage on which the world’s best teams compete for glory, fame, and large cash prizes. After two successful years, new changes are on the way to bolster the competitive scene and continue to encourage future growth for amateur and professional players worldwide. 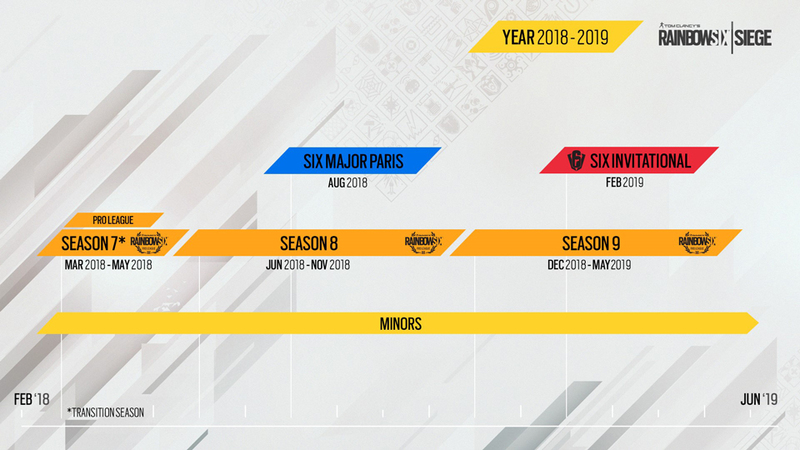 Starting in June 2018, the Pro League will consist of two seasons: Season 8 from June to November, and Season 9 from December to May. These seasons will feature competition in the four Pro League regions — Asia-Pacific, Europe, Latin America, and North America — and each season will conclude with a season finale in which the eight best teams of the season (two per region) vie for a prize pool of $275,000. To help bridge the gap between the current schedule and the new one, Season 7, a short transition season, will run from March to May of this year. After three months of heated matches, the Transition season finale will be hosted in the U.S. in May 2018. Once the new Pro League schedule is underway, the Challenger League will fill the gaps between Pro League seasons and continue to offer teams a path to take their shot at a place in the Pro League. The Challenger League will run two three-month seasons per year, starting in September and March. In addition to league play and season finales, there will now be two marquee events that will host the hottest Siege competition of the year. The Six Invitational, held in Montreal in February with a prize pool of $500,000, will be joined by the Six Paris Major, to be held in Paris in August with a prize pool of $350,000. These two Majors will each feature 16 teams drawn from the worldwide competitive scene. Getting into the Rainbow 6 amateur competitive scene is as easy as competing in the weekly online tournaments available in regions around the world. Every Sunday, Go4 tournaments are held on each platform, and there are additional community cups and local ladders offering teams a chance to test their mettle. A complete competitive calendar is coming soon, which will also include a list of LAN events (including Dreamhack events) where you can further test your skills. The next big showdown on the competitive Siege scene is coming next month, as the second annual Six Invitational runs from February 13-18 in Montreal. Top teams from around the world will shoot it out for a share of the $500,000 prize pool in the biggest Rainbow Six Siege competition to date. Check out the Official Pro League site for more information on upcoming matches and where you can tune in to watch the action. Rainbow Six Siege is out now for PC, PS4, and Xbox One. For more on the latest new Operators and the plans for Year 3, check out our previous Siege coverage. For the latest Rainbow Six updates, please visit the Rainbow Six Esports Twitter page or Subreddit.